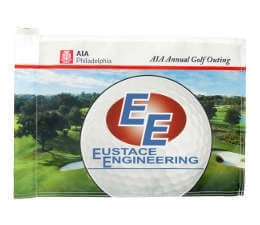 Whether you are hosting a corporate sponsored golf event, an individual hole sponsorship event, or you just need a golf flag with a logo for your backyard putting green, FLS Banners offers stock or custom golf flags you can reuse for years. 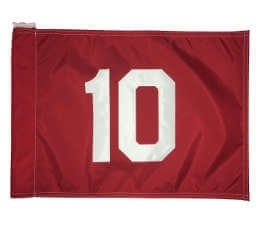 For special events and company outings, golf flags can be personalized with hole sponsor names or event logos, for one-of-a-kind flags. All golf flags from FLS Banners can be custom-made, quality printed on high-grade nylon. Our golf course flags are the official size for all professional golf courses so they can be used anywhere. FLS Banners also offers blank golf flags, numbered golf course sets, golf cart flags, and embroidered golf flags. 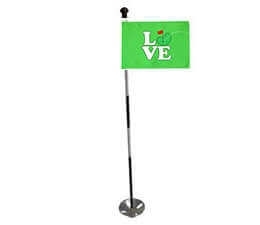 It is easy and affordable to decorate a golf course with custom golf flags. 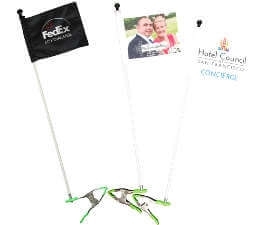 Add a personalized flair to your golf event with custom nylon flags. 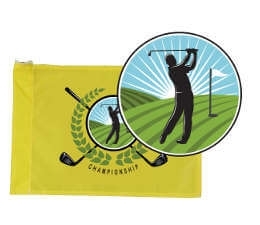 FLS Banners has everything you need for creating your own personalized golf flags, from custom printing options, colors, and mounting hardware. FLS Banners uses state-of-the-art sublimation and printing technology developed by our team over 35 years. As industry innovators, we are able to save you money, cut down on production time, and deliver a superior product. Prices include all set-up costs and an unlimited number of printed colors. 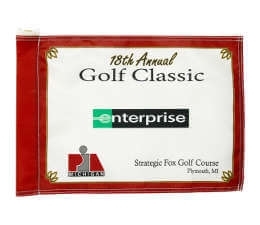 Golf flags can be screen or digitally printed with your own logo or design on high-grade nylon. We will select the method best suited to your design and quantity needs. 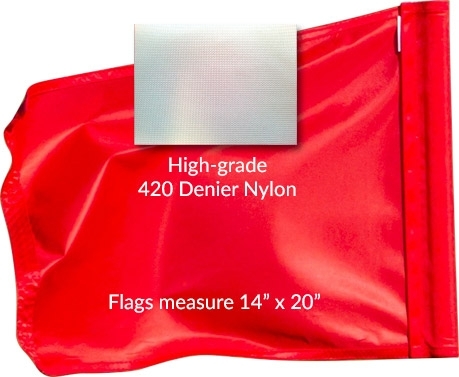 Prices on embroidered flags have to be quoted individually, depending on how many stitches your design will use. Contact us for more details on custom embroidered golf flag or call us at 800-537-0463. Tube Insert Style - Display pole inserted into the stitched tube at the end of the flag, allowing the full length of the flag to be displayed. Stand Out Style - Display pole is inserted in the flag loop and the flag stands out in front of the pole, displaying the full length of the flag. Traditional Style - The display pole is attached by three metal rings on the end of the flag. Secure and traditional display. Special Event - Custom printing can be applied the entire surface of the flag. The best option for events, tournaments, and other promotional uses. 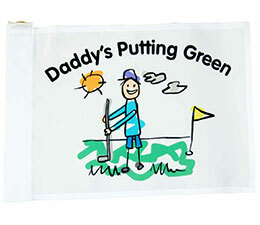 Putting Green Flags - Designed for use on the putting green. Meets golf regulatory standards for official use. Golf Cart Flags - Clips onto a golf cart for easy display. Send a message or add some color to your golf cart. Embroidered Golf Flags - These flags use embroidered stitching to design a logo or pattern. The embroidered style brings a classy look to the green. 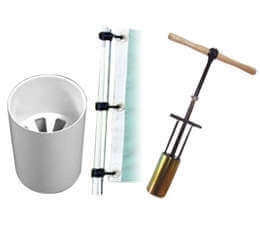 Putting Green Accessories - Everything you need to display your golf and pin flags, including pins, poles, practice green cups, putting green cups, flag swivels, cup hooks, golf hole cutters, and more. If you have any questions you may have about our products or design process, a representative is standing by. Contact us today!